When an itinerary promises sun, sea, sand and all the food you can eat, the level of excitement and expectation is set to maximum. And, when the destination is Thailand, everything is turned up one more notch. Thoughts of wondering in awe at historical and cultural temples, eating fresh Pad Thai by the roadside and lazing on white sand beaches fill the imagination. However, my enduring memory of Thailand won’t be any of these things… it’ll be something quite different in fact. Kanchanaburi as a town is fairly unassuming. Small and functional, it gives a glimpse of life in Thailand outside of the tourist spots. However, it has a haunting past that draws a thoughtful crowd. 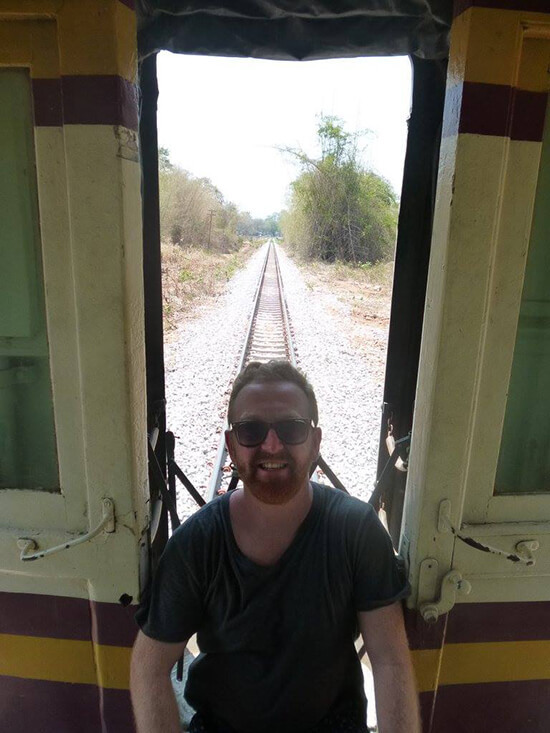 During WWII the area was ruled by the Japanese who, upon realising the needs for a link between Bangkok and Yangon (Burma/Myanmar), enlisted prisoners of war to create a railway. Over the course of 18 months, 180,000 workers worked in gruelling conditions to complete the line with around half of the people (including many Britons) perishing during construction. The railway would later be known as the Death Railway. Between the museum, the famous ‘Bridge on the River Kwai’ and the war cemetery (all visited in a half-day excursion), this part of my trip was humbling and fascinating in equal measure. But Kanchanaburi hadn’t yet delivered everything it had to offer. After a welcome, cooling train ride through a sleepy hillside onboard the Death Railway itself, we arrived at a desolate station. Here the river, full to the brim but flowing steadily, weaved through the greenery that towered either side of us. Its fast flow didn’t hinder our progress as we boarded a propeller-powered boat, which proceeded to slice and bounce through the water. Then, as we turned a bend in the river, our home for the night came into view, drawing a chorus of whoops and yells from the group. 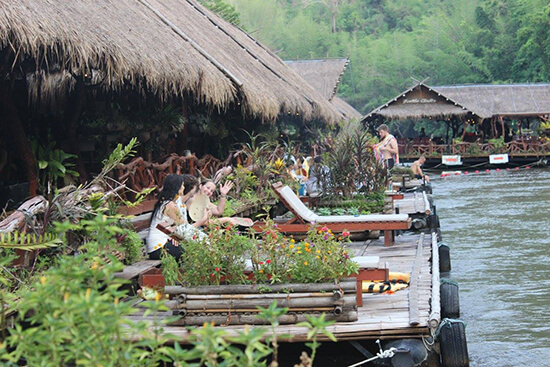 Bobbing gently on the water, the Jungle River Rafts accommodation stretched down the river for 150 metres tip to toe. Made purely from sustainable resources, mainly wood, bamboo and palm leaves, it comprised 40 twin and double cabins, sandwiched by a large restaurant, bar and relaxation area. The cabins’ location allowed us to explore the surrounding jungle easily on foot before pulling on lifejackets and jumping into the refreshing waters, dragged downstream by the current. The afternoon disappeared into a dream-like-state of hammocks, massages and cold beers against a backdrop of what is quite possibly the most peaceful location in all of Thailand. Following a dinner of never-ending food (the coconut-infused Thai green curry was mesmerising!) we all settled down on one of the cabin-front floating terraces, with just the light buzz of the jungle, the moon and candles punctuating the darkness. A blur of laughter, games and conversation between the group ensued; several beers and one snooze under the stars later and we all dispersed, comfortable beds and peaceful sleeps ahead. I took a moment to myself to swing my legs into the now pitch black river and breathe in the peaceful beauty of where I had ended up. I probably knew at the time (and certainly did by the end of the trip!) that this was my favourite part of the whole 10 days. 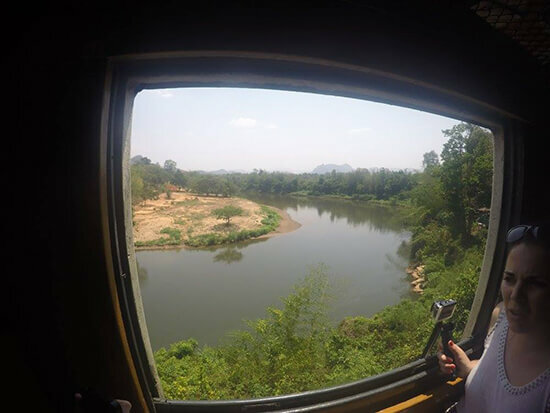 And considering my trip to Thailand was one of my best ever, it’s fair to say the 24 hours spent in Kanchanaburi and on the river was something really special. Sure, the people and the location itself were phenomenal. The food, activities and service top drawer. But a large part of why I loved it so much was owed to the fact that it was so different, completely unique to my trip and so unexpected. Sometimes it’s those snippets of an adventure, regardless of how small, that make the biggest impact. 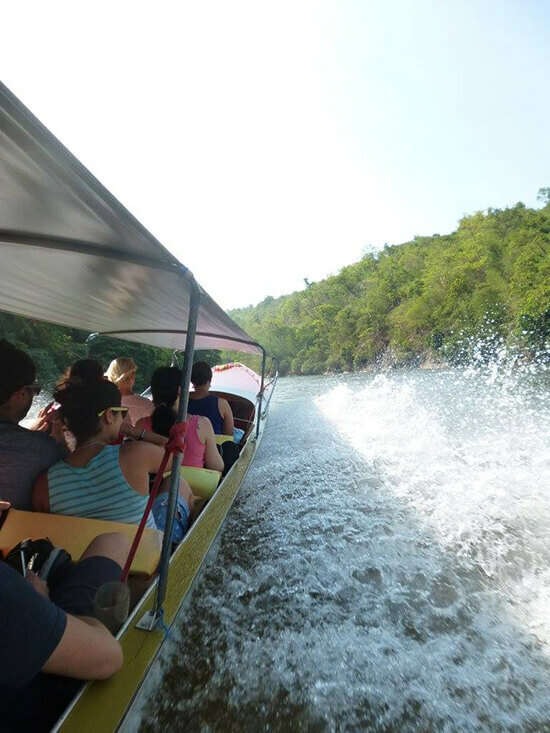 To discover Kanchanaburi like Tom, check out our range of tailor-made holidays to Thailand or take a guided tour with our partners Intrepid, who are offering 20% off Asia tours booked in June 2016, alongside discounted flights from KLM.